Order 2 starters and 2 main dishes and receive the least expensive main dishes for free!! Order 4 starters and 4 main dishes and receive the least expensive 2 main dishes free. Orders must be placed by 6:30pm. The offer is not valid on takeaway food and cannot be used in conjunction with any other promotions or special fixed price buffets. 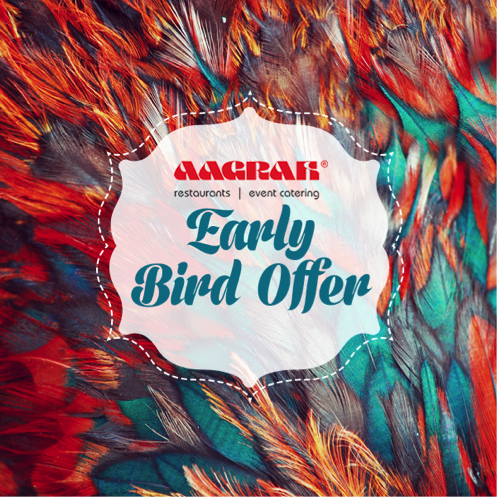 Early Bird offer is not valid in the month of December. Not valid on any of the Christmas Menus or Christmas Buffet Menus. The offer will not be available when the Christmas Menus are in operation.